In an ongoing public interest litigation, the Supreme Court of India is examining how to implement Intergenerational Equity in the context of iron-ore mining in Goa, India. The petitioner, the Goa Foundation, an environmental non-profit organisation, is advocating a comprehensive framework for Intergenerational Equity. The Supreme Court has already ordered that a Permanent Fund must be set up – to our knowledge a global judicial precedent. There are a number of other aspects being examined as well. In parallel, the Goa Foundation has launched a broader campaign, the Goenchi Mati (“Goan Earth”) campaign, to implement Intergenerational Equity in a comprehensive manner for all minerals in Goa. The eventual goal is to apply the framework across the globe, and for a broader class of inherited assets. Goa is a small state in India, sandwiched between the Arabian Sea on the west and the Western Ghats (a steep escarpment rising 3,000 feet) on the east, a mere 40 km away. While famous for its beaches, the interior of Goa is a landscape of rich, endemic biodiversity. Nearly two-thirds of Goa is covered in forest. Goa has nine major eco-systems including complex estuarine environments with combined agri-pisci culture, lateritic (clayey, rich in oxides) plateaux, and the Western Ghats, one of the biodiversity hotspots of the planet. At the same time, Goa has large deposits of iron ore, and has been a significant exporter of this for over 50 years. Mining was a major economic activity in Goa. It was also Goa’s biggest environmental and social problem. As long ago as 1987, the benthic (bottom-dwelling) life of the rivers, including the iconic windowpane oyster, was almost wiped out because of the iron ore covering the river beds. There have been a number of other adverse effects, including: disappearing hills, forests, fauna, and springs; increases in respiratory disease; deaths from unsafe roads; and iron-ore dust blanketing fields. The China boom created a sharp spike in iron prices from 2007 onwards. This resulted in a reckless expansion of mining in blatant violation of all laws. The Shah Commission, in its report on Goa, revealed a bleak picture of government complicity. At a time when the state budget was approximately Rs. 6,000 crores (US$ 1 bn), the Shah Commission estimated that mining outside lease areas alone amounted to Rs. 35,000 crores (US$ 6 bn). It also estimated that, with the known reserves and the approved rate of extraction, the reserves would be exhausted in nine years. What would future generations do? 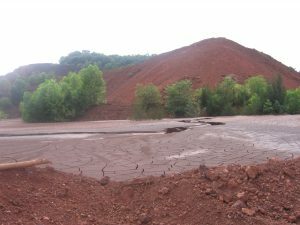 In 2012, the Goa Foundation, an environmental non-profit organisation, filed a Public Interest Litigation (PIL) – the “Goa mining case” – in the Supreme Court of India, asking for a thorough investigation of the industry, and for a permanent ban on account of the severe environmental damage in a biodiversity hotspot and the imminent exhaustion of the ore. The government of Goa opposed a permanent ban on account of the economic dependence of the state and the government on mining. The Supreme Court of India has been proactive in matters of the environment, intergenerational equity and the public trust doctrine (the principle that resources are held in trust by the state for the benefit of the public). It has ruled that four principles – intergenerational equity, sustainable development, the precautionary principle and polluter pays principle – are part of the Right to Life in the Indian Constitution. It has recognised the intergenerational equity principle in the context of conservation of scarce resources like minerals. It has ruled that the public trust doctrine, again a part of the Right to Life, extends to all natural resources, and the state is a trustee for the people and especially future generations. In the Goa mining case, the Supreme Court wanted to implement intergenerational equity on grounds of the exhaustion of the reserves as well as the widespread damage to the environment and social fabric of Goa. It appointed an Expert Committee to examine this issue and recommend a cap on mining. In parallel, the Goa Foundation developed a framework for implementing intergenerational equity, and recommended this to the Expert Committee. The public trust doctrine makes natural resources a part of the commons, owned equally by all, and legally owned by the state of Goa (in the most part). The intergenerational equity principle is quite simple: the resources and opportunities that the present generation has inherited must be available to future generations in perpetuity. Old civilisations, religions and cultures have a simple rule of thumb – if you inherit something, you are merely its custodian. It must be passed on to the next generation. A change in form is permitted – you can sell ancestral gold and purchase land – but not a diminution in value. In India, this rule of thumb is an integral part of the culture and inheritance law for most of the population. The first step is to enumerate the assets (impacted by mining) that the present generation has inherited. Three immediately come to mind. First is the opportunity to mine and use the iron ore, which will deplete to zero in nine years. Second are the environment and social fabric, which are being destroyed and degraded to different degrees depending on which aspect we examine, proximity and other factors. Third is the mineral itself, which has value and, prior to mining, is part of the public trust, a part of the commons. A more thorough analysis will bring forth other assets. For instance, the decision of when to mine is a real option with very significant value due to the high volatility in commodity prices. There are many minerals associated with the iron ore, including manganese ore, gold, rare earths, bentonite, and manganiferous clays; indeed, it has been estimated that associated minerals may be much higher in value than the iron ore.
All of these inherited assets deplete with mining. Therefore the state, as the trustee for the people and especially future generations, must ensure that new assets of at least equal value be created. If there is a diminution of value, it is in effect a tax on the people applied equally – a per head tax or a poll tax. Losses are contrary to the public interest. Further, to the extent that the mineral value is captured by private mining entities, it is a transfer of wealth from everyone going to make a few rich. This violates equality, and is anti-socialist. For the first asset, the opportunity to mine, the Goa Foundation has recommended an extraction cap of 1/200th of the proven reserves. This cap would currently be around 5 mtpa (million tons per annum), compared with the peak extraction of over 50 mtpa. This will ensure the mineral opportunity lasts at least 200 years, nearly seven generations. Technically, this will not ensure intergenerational equity as the opportunity is capitalised by certain individuals, not the state as a whole. This implies a loss from the commons. However, the cap is something that can be implemented in practice, and would be an improvement on present practice. Environmental damage can range from breaking off a single leaf all the way to denuding the Western Ghats. One is trivial, the other is catastrophic. There are a number of mechanisms to deal with marginal damage, essentially an application of the polluter pays principle. New trees must be planted for those cut down, the environment must be restored after mining, etc. This principle can be extended to many impacts of a single mine. There are additive effects however, especially since nearly 100 mines were operating, and using public infrastructure like roads. A cap-and-trade system would be incredibly complex to administer, considering the vast number of factors, locations and users. What the Goa Foundation has recommended is an initial cap set at 12 mtpa, which was the extraction level at which the benthic life very nearly became extinct. Various environmental parameters would be continuously monitored. If thresholds were breached, then it would trigger an automatic reduction in the cap. Applying the precautionary principle, the cap would drop easily, but rise cautiously. Little is lost if mining slows down: the next generation can still extract the mineral. This approach should ensure that no permanent damage occurs, and any temporary damage is also compensated under the polluter pays principle. The third asset, the value of the mineral itself, has a relatively simple solution. When minerals are extracted, create a Permanent Fund for the future generations. This is the gold-to-land strategy. There are three essential steps. First, the owner (state of Goa) must ensure that it receives the full value of its mineral – the economic rent. Second, it must invest this entire amount into the Permanent Fund. Norway currently does this. The Permanent Fund would mirror the public trust – the state as trustee, the people and future generations as beneficiaries. Traditionally, inheritances were saved in “non-wasting” assets, such as precious stones, precious metals and land. A Permanent Fund must reinvest to the level of inflation in order to ensure that it is also “non-wasting”. In the third step, any real income (after reinvesting for inflation) should be distributed as a commons dividend, a Citizen’s Dividend, like Alaska already does. By implementing these three simple steps, we are ensuring intergenerational equity as well as intragenerational equity, at least as far as the mineral value is concerned. Should we exhaust the minerals? There is an additional aspect to consider. Traditional non-wasting assets were physical assets, not impacted by the form of the economy. Land is useful in a barter, subsistence or hunter-gatherer economy. Precious stones and metals are shiny and rare, attractive to all humans. The Permanent Fund, however, is wholly dependent on the present financial economy and legal structure. There are many ways the Permanent Fund can be raided. Nauru provides the cautionary example, converting all its phosphate deposits into a US$2 bn Permanent Fund. However, mismanagement has whittled the fund down to $50 mn. Nauru today survives as a refugee processing centre for Australia. Risk mitigation would require that only a fraction of the mineral be extracted and converted into Permanent Fund assets. We would arrive at the same conclusion if we examined the real option of when to mine. In theory, the human species will last millions of years more. The China boom was certainly not the peak for all times. This raises the question of when to mine. Again, prudence would dictate that only a small fraction be extracted at the present time. However, the Goa Foundation has not made any recommendation on this aspect so far. The Goa Foundation estimated whether the state of Goa was receiving the full value of its minerals. In one method, using World Bank data series, over a five-year period the state of Goa received less than 1% of the value of its minerals. A much more refined estimate was made using the audited financial statements of Goa’s largest miner, Sesa Goa (now Vedanta). Over an eight-year period, the state of Goa lost more than 95% of the value of the minerals (our economic rent calculations subtracted all expenses and a generous 20% post-tax return on assets for the miners). The loss was 28% of GDP and nearly two times the state government revenues for those eight years. The per-head tax (i.e. the effective loss per head) was nearly three times the poverty line, an astounding Rs. 3.6 lakhs ($10,000). Some 60% of the mineral value – more than the entire state government revenues – was captured as excess post-tax profit for the mining companies. This clearly explains why the Shah Commission found complicity of the government executive and politicians in the widespread illegalities. The Resource Curse had struck. Further analysis shows that huge losses of mineral value from the commons is a planet-wide phenomenon. It is driven by a race to the bottom by developing countries trying to attract extractors to their shores. Extract they do. This is a major driver of global inequality, crony capitalism, the destructiveness of mining and climate change. The Expert Committee made an interim recommendation to the Supreme Court of an extraction cap of 20 mtpa on the first two grounds (opportunity to mine, environmental damage), and the creation of a Goa Iron Ore Permanent Fund. The Supreme Court gave the Expert Committee 12 months for final recommendations. It also ordered an interim cap of 20 mtpa, and that henceforth 10% of the sale value of iron ore must be deposited into a Goa Iron Ore Permanent Fund. To our knowledge, this is a global judicial precedent. The details of the fund were to be worked out by the state government, but approved by the Supreme Court. The Expert Committee has submitted its final report, recommending a cap of 30 mtpa, and the extension of the Permanent Fund across India. The Goa Foundation is challenging the high level of the cap on both grounds (opportunity to mine, environmental damage). At 30 mtpa, the Shah Commission itself estimated that the mineral would be exhausted in 20 years. Further, there is a plethora of scientific studies showing severe impacts at levels as low as 12 mtpa. The Goa government would like a still higher cap and an impermanent Permanent Fund – one which is largely spent by politicians, not saved for future generations. The matter is before the Supreme Court. In parallel, the Goenchi Mati campaign is pushing for the adoption of the three essential principles – zero-loss mining, saving the entire value in the Permanent Fund, and the sole distribution from the fund via a Citizen’s Dividend – and for extending it to all minerals. The connection of these principles to all kinds of commons, along the lines of Capitalism 3.0, is clear. The Citizen’s Dividend is also a form of Universal Basic Income – albeit as a right of ownership, not a subsidy or a benefit.